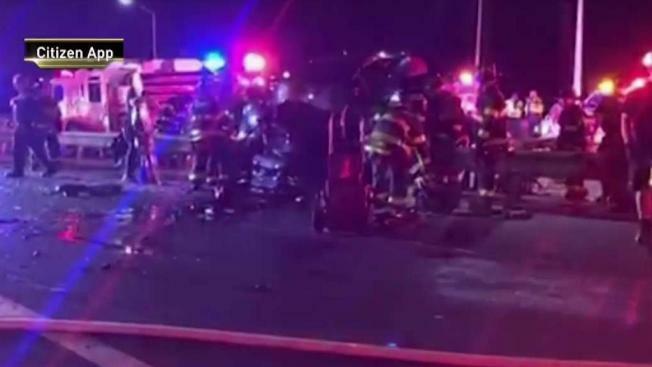 A passenger in a livery car was killed in a wrong-way, head-on collision on the Belt Parkway in Brooklyn Thursday morning, authorities say. Roseanne Colletti reports. A 27-year-old Manhattan media professional was killed when an alleged drunk drove the wrong way on the Belt Parkway and smashed head on into the livery cab where the young man was a back seat passenger, authorities say. Authorities say Gerald Obah's cab was hit by 50-year-old Aleh Sheipak, who was allegedly under the influence while driving his 2011 Volkswagen SUV eastbound in the westbound lane of the Belt Parkway near the Verrazano Bridge approach. Sheipak and the driver of Obah's cab -- an Accord that authorities say was operating as a livery vehicle at the time -- were taken to a hospital in stable condition. A 29-year-old woman in the front passenger seat of the Accord was also hurt; she too was taken to a hospital in stable condition. Obah died at the scene. According to his LinkedIn page, Obah has worked as a digital media professional in the city for the last six years. He graduated from Syracuse's Martin J. Whitman School of Management and was captain of his high school's varsity cross country and track teams, as well as a participant in its dance programs and thespian societies. His brother, Eugene Obah, told News 4 that his family in Maryland received the heartbreaking call from NYPD. "It was just absolutely devastating to hear about it in this way. Just horrible," he said. "I'm more angry about this than anything else, to be honest with you, given the circumstances that took my brother's life, that this was a drunk driver," he said. It was not immediately clear what livery company the Accord driver was working for or if the occupants in his vehicle were paying passengers. Sheipak, from Brooklyn, was the only occupant in his Volkswagen vehicle at the time of the accident, and will face manslaughter, vehicular manslaughter, DWI and DWAI charges, according to authorities. It was not immediately clear if Sheipak retained an attorney who could comment on the charges. An investigation by the NYPD's Highway Collision Investigation Squad is ongoing. Eugene Obah said his brother "just wanted to enjoy himself, enjoy life... he is going to be missed."